Brian Terrell addresses a judge at Kansas City’s Municipal Court during a trial over a protest against nuclear weapons in 2010. 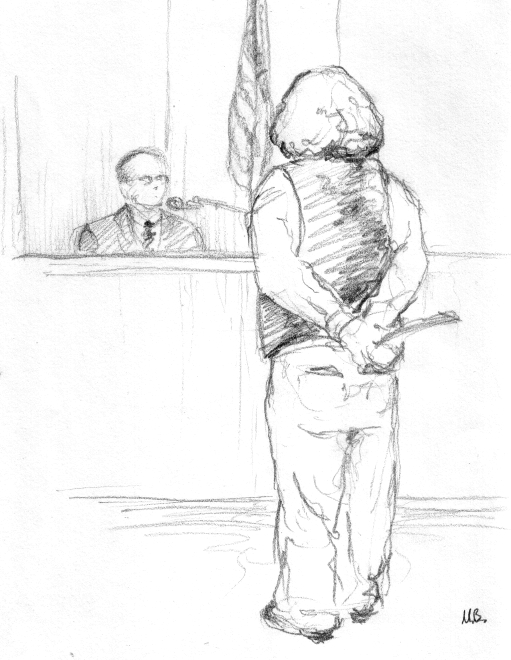 Standing in front of a judge is intimidating (to me anyway). It seems a whole lot easier to cross a line, refuse to move, or lie down in the middle of the street, than stand before a judge. I would rather be trussed up in handcuffs and crammed into a crowded police wagon than stand before a judge. They are often world-weary and judgmental (I guess it comes with the territory). I would rather stay in the grubby holding cell and drink the water that comes out of the little fountain on top of the stainless steel (seat-less) toilet than stand before a judge. They don’t really appear to be listening to what the people standing before them are saying. They often look out from heavy eye lids and one gets the sense that they think they have heard it all before. It is easier to hold a big sign or wear an orange jumpsuit or participate in street theater or leaflet the tourists or engage in conversation with an angry and alienated guy, than try and explain my motivations and thinking to a judge who I assume doesn’t have the time or interest to care. I haven’t had a lot of chances to stand before a judge, but I am always really scared when I do. The most recent time, I emerged from more than 24 hours of “processing” in leg irons (I put “processing” in quotes to convey how much it sucked). We had been arrested early in the afternoon on January 11, 2008 at the Supreme Court, trying to unfurl a banner that said “Justice Denied.” In total, there were more than 90 of us inside the court building and on the steps outside, many dressed in orange jumpsuits and the rest wearing orange tee shirts under our jackets. Inside, after the banner was snatched away from us, we knelt down and began reading a statement together that described what men at Guantanamo had experienced of “U.S. justice.” We decided not to carry identification, symbolically and in a real way taking the names and identities of individual men at Guantanamo into U.S. courts and shedding some small bit of privilege and control that comes along with having a U.S. issued ID. In the many hours that followed, we went from holding cell to holding cell. The Supreme Court police do not often deal with protesters and had never dealt with so many and so many who did not have ID. The other marshals and corrections officers who dealt with us were not happy to have us and the added hassle of names like Sami al Hajj (since released from Guantanamo) and Shaker Aamer (who remains at Guantanamo)—especially as Friday night grew closer. So, from place to place all night long, we traveled. There was not a lot of food or water along the way. Sometimes it was very cold and other times it was very hot. I could feel myself getting grubbier and grubbier every time I moved from cell to cell. It would have been boring if I was not surrounded by so many wonderful women, we talked and sang and played word games to pass the time. Eventually, we were put into leg irons and taken by the marshals to our last stop before seeing a judge. It was Saturday afternoon. The final holding cell was very crowded and a number of women threw up because they were dehydrated and hungry. We all struggled to get comfortable amid each other’s limbs in leg irons. Eventually, my number was called and I untangled myself from everyone else and shuffled down a long hall accompanied by two clean cut marshals making overtime bonus money. I left the stark, institutional hallway and entered a warm and beautifully paneled court room. The whole room seemed to hum with cleanliness and wholesomeness and I became of aware of how dirty my hair was—they had taken my hair pins and it hung lank and oily around my face—and felt inadequate in my leg irons and my sleeplessness. “Your honor, I am here on behalf of Yasser Talal al Zahrani who died at Guantanamo in June 2006. My name is Frida Berrigan.” The effort was extraordinary. It took all I had to get those words out with some semblance of dignity and confidence. I was there on behalf of this Saudi Arabian man who at the time I thought committed suicide at Guantanamo. I later learned from Scott Horton’s January 2010 article in Harper’s magazine, that there is strong evidence to suggest that al Zahrani and two other men were killed during interrogation at Guantanamo. It was worth the many hours of lock up and processing. It was worth the leg irons. It was worth the discomfort and butterflies of speaking even a few words to power. It was the first time that Yasser Talal al Zahrani’s name was uttered in a U.S. court and recorded there. He was dead, and my government was responsible. And I had not forgotten him. Why am I telling you this story? Because in my mind, going to court is part of the action. Indeed, it can be a very powerful part of the action. About half our group ended up taking this action into court for almost a week (the charges against me were dropped because I was not wearing an orange “Shut Down Guantanamo” t-shirt and they could not make a positive identification of me). In May of that year, before Judge Wendell Gardner, 35 people appeared for trial. They represented themselves. They began the trial by explaining to the judge that half the group would be silent throughout the trial in solidarity with those on whose behalf they acted, those who could not themselves speak in court. They would stipulate to the facts and rely on their co-defendants to make the case. They wore orange jumpsuits into the court room each day and held small signs with the name of the men on whose behalf they had acted. The rest of the defendants participated in the trial, taking the stand to talk about why acting at the Supreme Court on January 11th was important to them, cross examining witnesses (mostly our arresting officers). My friends’ amateur legal eagle efforts and the spectacle of silent defendants drew curious lawyers, correctional officers and people who worked in the busy downtown DC court building into the courtroom for hours at a time. Everyone who worked in that building, all those lawyers and police officers and marshals and people there to face their own judges and charges, knew why we were there. We and our cause (and our loose interpretation of court decorum) were the topic on everyone’s lips for the four days that the group was on trial. At the end, after impassioned statements that left the whole court room in stunned silence and not a few people in tears, the judge pronounced people guilty, offered fines and when those were refused by almost everyone, started handing out 5 to 30 day sentences. And the trial and sentencing were both covered by the Washington Post. There are those that would argue that court time is wasted time, and that time in jail or prison is time away from the movement. I checked in with a few friends on this question and would like to share some of their thoughts. For me, the courtroom is one of the most difficult places to be nonviolent. It is so easy to get sucked up into playing the legal game, rather than sticking to telling the truth in love… Of course, I know it isn’t about “winning,” it’s about telling the truth in love, taking on suffering rather than inflicting more suffering, and recognizing that everyone has a piece of the truth. an opportunity to reflect and write about the action, and to minister to my prison sisters. Maybe it’s a time to deepen the resistance experience—because there is time to reflect and think about the action without a lot of the usual distractions. It is an uphill battle… The scene is stacked against any reality being witnessed to. Half truths, lies, excuses and evasions are promoted, truth ruthlessly suppressed. It is a system that depends upon its victims cutting their losses, pleading out for a lesser sentence regardless of guilt or innocence…. This monotonous drone of fractured Latinisms and legal gibberish is shattered when defendants speak simply and clearly, by women and men taking responsibility for their actions of conscience without apology or alibi, who risk putting the system itself on trial. Good things can be told in court but only when its dominant paradigm is broken. For many judges, being asked to think and to actually make informed decisions is an intolerable effrontery. A few others, on the other hand, might be relieved by such a break in the tedium of their day; some rejoice to hear for the first time in years on the bench the constitutional questions that they studied in law school! In any case, it wakes them up. Tim DeChristopher experienced something similar. The environmental activist went to an auction and bid on and won more than $1.7 million in federal oil and gas leases before telling federal agents that he was there to disrupt the auction and had no intention of or ability to pay for them. DeChristopher’s attorneys wouldn’t be allowed to use a necessity defense—the argument that he had to disrupt the auction because of his beliefs about climate change. Second, the defense couldn’t bring up the fact that DeChristopher had actually raised money to buy the land; the court’s view was that, by then, the fraud had been committed. Third, the fact that [Department of Interior head Ken] Salazar had removed the leases from auction wasn’t admissible. Finally, the defense could not inform the jury that past bidders had not been able to pay for their parcels either. In July, he was sentenced to two years in jail and three years of probation after being found guilty of interfering with an auction and making false statements on bidding forms, two felonies. Indeed it is what patriotism and love look like. Time in court can be tedious, but it is not a waste. Nothing crystallizes one’s thinking and builds community like preparing for court and participating in a trial and being ready to go to jail. Time in jail can also be tedious—and studded with deprivation—but it offers an opportunity for reflection, prayer, service to others and insight into an often hidden and criminally unjust world: the criminal justice system. In Washington, DC, particularly at the White House, but in other places as well, there is a “pay to play” scheme called “post and forfeit.” You bring your grievance and cause to “America’s Front Porch,” and sit down in a delineated zone in front of the White House, or stand still holding a sign, and you will be threatened with arrest. If you fail to move, the Park Police will arrest you and take you to a processing center in a forgotten and often flooded corner of Washington almost completely inaccessible to public transportation. There they will record all of your information, remove and list all your belongings, and—after a time—offer you an opportunity to “post and forfeit” in order to avoid further processing at another larger (and the intimation goes, more dangerous) facility to see a judge at some point later that day or the following morning. You “post” a fine—about $100 in most cases—and “forfeit” the right to a day in court. Your “crime” disappears from your record after 6 months if you do not get arrested again. Once you hand over the money, you and your belongings are reunited and you are shown the door. Hopefully there are friends waiting to drive you away, because it is a long walk to the metro station. After being handcuffed behind our backs we were searched, photographed and asked if we planned to “go through the system” or “post and forfeit.” Then we were loaded in a police van and driven to the Anacostia Police Station. There, we waited a while and then paid a $100 fee called a Post and Forfeit. This allowed the protestors to be released without returning for a trial. It was like paying the fine for the violation (“Failure to obey lawful order”) in advance. Not everyone felt good about the civil disobedience involving so much coordination with the police, and the requirement of $100 to pay the Post and Forfeit. Since when is CD [civil disobedience] supposed to be only for people with a hundred to spare? For me, engaging in civil disobedience is part of the karmic and political ‘rent’ I feel the need to pay for being an American, living in the richest and most brutal country in this troubled world. But it is tough to pay rent to the very people who police this nation, right? Now, I am not disparaging 350.org or all of the activists who got arrested and paid fines. It has to happen sometimes. And for many arrested for the first time, it was a positive and empowering experience, made even better by organizers who could pretty much guarantee exactly what would happen after arrest by encouraging everyone to follow the script—at least after the first day of action, when the first wave of activists were held for two days. But I am questioning—especially when all eyes are on our crippled economy—the wisdom of an organizing strategy that includes paying police departments and court systems. Press reports estimate that 1,253 people were arrested over the course of 350.org’s two-week campaign of arrests. Assuming that most activists posted and forfeited (those with recent arrest records would not be eligible), that is well over $100,000 that activists put into the pockets of the National Park Police this summer. That is a huge. It is salaries for a handful of full time organizers, stipends for a peaceful army of interns and organizers, rent on pretty sweet office space, millions of copies and bytes of computer bandwidth (or whatever it is called). The anti-Tar Sands movement is really impressive and has had a significant impact, bringing this somewhat obscure issue to the front pages of newspapers and the front burner of people’s hearts. And, there has been a policy impact as well; the Obama administration recently announced that it would postpone a decision on the Keystone XL pipeline until after the 2012 election. They flexed their muscle again on November 6th with an action surrounding the White House. Tar Sands Action has collected more than 3,000 commitments to keep the pressure on in the coming months. That is amazing. They are keeping the momentum going! Perhaps, in circumstances where we find ourselves encouraging arrestees to “post and forfeit” for expediency or ease of organizing, we should ask that folks double the fine. What if we ask those who can come up with $100 for a fine, to dig even deeper for an additional $100 to sustain the movement? If we are going to end up fundraising for the state, we might as well fundraise for ourselves as well. Imagine what good the movement could do with the money! Or, when folks come again to DC—now veterans of the White House arrest—maybe they can rethink the “time is money” approach, opting instead to prepare people for the discomfort and inconvenience of Central Cell Block, and empower them to “tell it to the judge,” while acting creatively and in community to put these dirty, earth-killing policies on trial. A great article, Frida! Very inspirational and thought provoking. The activists you discuss are so courageous; I hope I find the same courage when I and 13 others face a judge this January 3, when we go on trial for speaking out against torture at Guantanamo when we visited the House of Representatives last June. That courage we all seek can be found and nurtured in our communities of resistance. We all need to support our friends and colleagues in the peace movement! Such a beautiful article Frida! I was laughing out loud and at the same time so deeply moved and motivated. Thank you for sharing your beautiful gift and insights. Thanks Frida for taking us back to basics and forward to some good fresh thinking. I suppose that we are not just telling it to the tired, alienated judge, but to the powers and to the cloud of witnesses. It would, however, be nice not to have to pay the powers to do it.